Via my colleague Robert, a series of pictures aptly titled Lords of the Logistic. In my travels in Asia, I was astonished by scenes like these frequently. At a party tonight, I told anyone who would listen that my daughter started walking last night. In a separate conversation at the party, a friend urged me to post here more frequently. So… if you haven’t heard yet… Chiara walked on her own for the first time last night! Jeanhee has more info. 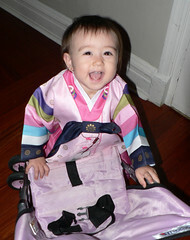 Chiara was ready for the Korean-American parade a couple of weeks ago.